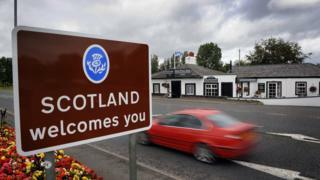 What next for the Borderlands' £345m? The UK and Scottish governments revealed their levels of support for the Borderlands Growth Deal last week. The local authorities involved are now working towards a full business case for projects they want to take forward. However, it is hoped some of the more "shovel-ready" schemes could start within a matter of months. They are now working on how to take it forward. "The governments have given an indication of the amounts of money that they are prepared to spend," said the leader of the Dumfries and Galloway authority Elaine Murray. "So, in Scotland, between ourselves and Scottish Borders Council, the Scottish government will provide up to £85m over the 10 years and the UK government will provide up to £65m. "But, at the moment, we haven't had the final negotiations on what they will spend that money on." She said they hoped to agree heads of terms - an outline business case for its key projects - before the end of this Scottish Parliament term ahead of working up the full business case. "However, the governments have said that if there are projects which are ready to go they would probably release the money earlier," she added. "So we have to try to identify those ones which we could actually make a fairly rapid start on and make a bid for those first. "We would hope that if we have projects which really are shovel-ready we may be able to make a start on them later in the year. "Some things will take longer because there will be more detail that needs to be worked out in the full business case but some things we may be able to progress later towards the end of the year." Among the specific projects already on its agenda are Carlisle Station Gateway, the Chapelcross Energy Park near Annan, Berwick Theatre and Conference Centre and a Mountain Bike Innovation Centre in the Borders. A feasibility study into extending the Borders Railway beyond Tweedbank to Carlisle is also being examined. Ms Murray said that there was no set order for carrying out the projects, although some might be more complex to achieve than others. However, she said they had also identified key themes for investment which would benefit the wider area. She said: "One of the things that people say is: 'Chapelcross is all very well but what is it going to do for Stranraer? What is it going to do for Wigtownshire? What is the benefit to the rest of Dumfries and Galloway? "The themes are the ones which may produce the projects which assist in other areas. "For example, one of our themes is digital connectivity - if we are successful in achieving that one that would be something which would benefit the whole of the region rather than just one part of the region." She also outlined how the spending would be split from UK and Scottish government sources. "In Scotland, obviously, the Scottish government will fund things which are devolved and the UK government will fund things which are reserved," she said. "Obviously some things may be partially reserved and partially devolved so they would get money from both and some things will cross the border." One such issue would be the Borders Railway feasibility study. "That would be something that would be partially funded by both because it would be a UK and Scottish government responsibility on either side of the border," she said. Although there has been some frustration at the pace things have moved at, the council leader said they had accelerated recently. "It has actually progressed fairly quickly compared to the other city region deals across the country," she said. "Ours has actually progressed a lot more quickly - partly because the five local authorities put a great deal of effort into trying to progress it fast. "We knew that we were coming up against the end date for this type of funding to be made available so we had to get it in quickly." Ms Murray added that they would now be working to ensure they maximised the benefits of the support. "On the Scottish side it is exciting because it will coincide with the introduction of the new enterprise agency and part of what we are going to have to do is to work out how we align those best so that we get the best bang for the money that is available," she said. "It is an exciting time for the region - it is not going to be a panacea for everything. "It is not the sort of money that could dual the A75, for example, it is not money of that magnitude but it is money that if it is used wisely and it is used together with other sources of funding to produce the maximum effect it could make a real difference to our region."